This week a new schedule of workshops for September through to December has come out. The list is going up on the web in the next couple of days. Make sure you pick up a leaflet when you come into the shop. 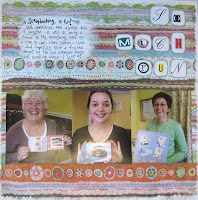 Scrapbooking with Kate is back with September's theme of Mini Books and Picture Frames. There is also a display in the shop of some of Kate's Scrapbooking pages, which are absolutely gorgeous. 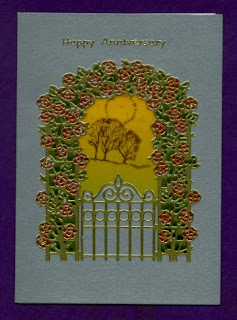 Have you seen the cards Hilary has made from Martha Ospina's new book My Passion My Parchment, they are stunning. If you want to learn to do Parchment Craft ask about the New Beginners Parchment Workshop is starting in September. One of the biggest debates in the scrapbooking world is what you scrap. Do you scrap the big occasions, the birthdays, holidays, weddings, births....or do you use your scrapbook to record the little things, little stories, quirks, odd moments that aren't really a special event, but make you happy and are worth recording? I think for me, everything is worth recording. I don't scrap chronologically (in that I don't stack my photos up and say "well, I can't work on this pile until I've finished that pile"). I organise my photos by theme, or by occasion (whichever works best....that's a post for another day) and I make pages about the things that I feel are important or interesting. Sometimes I scrap about what we did, sometimes I scrap about how I feel. That's what I love about this hobby: there are no rights and wrongs. If something works for YOU - then that's all it needs to do. There are so many different styles and formats, so many different papers to play with...it's easy to get overwhelmed. So just remember that you are doing this for you - and there is no-one else you have to please. Why I am so Happy? Well you know how it is one day is pretty much the same as the next and before you know it they have merged together and its another Year that gone rushing by. Yes you've guessed it I am another year older ! and Wiser ? Don't think so ! and Happier? Most definitely ! What makes me happier is sharing my time with my Beautiful Wife Hilary, who gets more and more beautiful each year, whilst I just get older and Grayer! But what makes my Birthday so special each year is that it's also our Wedding Anniversary aswell. Here are the two cards I got from Hilary. 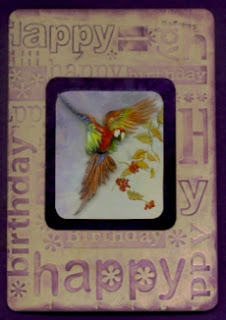 This card was embossed using the Cuttlebug before being coloured and finished with a 3d-decoupage parrot. This card made use of a peel off which was enhanced by colouring with Sakura pens, the centre of the card was cut out to show the rubber stamped insert paper. In my workshop this month we had the theme of "Tags". The room was packed to capacity, and it was a real hive of creativity, and noisy too with everyone throwing ideas around. Everyone came up with fantastic cards! We always have a laugh at the workshops! Here are some photos of the cards June made in the workshop- Brilliant!! Next month we are making " Different Shaped" Cards....so a craft knife, craft mat and pointy scissors are the must have items for my next workshop.